Premier League Bournemouth made light work of MK Dons on Tuesday night with a 3-0 win at the Vitality Stadium. 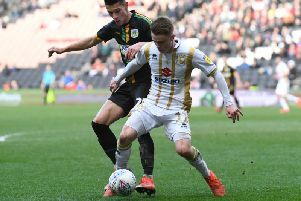 Eddie Howe's side were two up by the break, with Lys Mousset and Ryan Fraser scoring for the home side, who could have been further out of sight had it not been for keeper Lee Nicholls. The Dons number one denied £25m record signing Jefferson Lerma twice, Jermaine Defoe and Jordan Ibe with fine saves to keep the score civil, but Ibe got his reward in stoppage time to wrap it up for the Cherries. The defeat was the first for manager Paul Tisdale, who made four changes to the side which saw off his former club Exeter City on Saturday, most notably handing Rhys Healey his first start since signing from Cardiff City on loan on Friday, while Oran Jackson made his first start in two years. Osman Sow was named amongst the substitutes despite rumours of his imminent departure, while Baily Cargill kept his place in the side to take on his former club. The Premier League Cherries made 10 changes from the weekend, with £25m record signing Jefferson Lerma among those getting a game against the League 2 side. As was to be expected, it was all Bournemouth in the opening exchanges. Lee Nicholls did well to tip over Ryan Fraser's effort, but there was little he could do when Lys Mousset skipped past two challenges to rifle home the opener after 15 minutes. Nicholls did brilliantly barely two minutes later to deny Mousset a second, flying to his right to keep him out with a firm right hand. Artur Boruc barely had a save to make in the opening half, only twice plucking crosses out the sky, while Nicholls needed to be alive to Jermaine Defoe's threat, tipping his shot around the post on the half hour mark. Not wholly overrun though, Dons played some nice stuff at times. Ryan Watson and Ouss Cisse showed some clever footwork in the midfield, but Healey spent a fairly isolated 45 minutes barely touching the ball. But Nicholls would be picking the ball out of his net again on 37 minutes when Jordan Ibe broke down the Dons left, pulling back for the Scot to thrash home Bournemouth's second with aplomb. Diego Rico was inches away from making it 3-0 just before the hour, but saw his well-struck free kick thump against the bar before Nicholls again denied the Cherries when Lerma tried to bend one into the far corner from 25 yards. With 18 minutes to go, Sow was reintroduced to the Dons fans after missing first team action since March, replacing the frustrated Healey, who only really had one effort of which to speak, carving it himself after a deep cross fell to his feet, though his effort cannoned off the chest of Lerma. Sow, playing up alongside fellow substitute Sam Nombe struggled to make an impact against the Bournemouth defence. Bournemouth would add their third in stoppage time when Ibe got his reward for a solid night, lashing past Nicholls to wrap up the evening in style.